These myRA plans were later closed by President Trump. Read “Failed Government myRA Program Closed” for more information. The 1974 Employee Retirement Income Security Act (ERISA) sets minimum standards for retirement plans in the private sector. Among its requirements, ERISA prohibits plan sponsors from self-dealing, conflicts of interest and failure to provide diversification. Just last year, the Supreme Court ruled that workers could sue their plan sponsor over ERISA violations. On January 29, President Obama decided to become a plan sponsor for the entire country. He directed the Department of the Treasury to create a new type of retirement account. Called a “myRA” account, it is available to households with an annual income below $191,000. The closest retirement account to a myRA is a Roth account. Like a Roth, contributions to the myRA will be made after tax, and withdrawals in retirement are tax free. The annual maximum that can be contributed is also $5,500. Unlike a Roth, myRA accounts are capped at a maximum balance of $15,000. After that amount is reached, no additional contributions may be made. A Roth account has no such limit. Furthermore, Roth IRAs allow any amount to be contributed at any time independent of your employer. The myRA accounts are touted as allowing savings as low as $25 initially and $5 for subsequent contributions. But this limits you more than a Roth. Workers should be saving 15% of their income each year toward retirement. Thus workers earning as little as $37,000 should be maximizing their retirement account annually for $5,500. Under myRA, they could only do this for three years before hitting the limit. They would be unable to save more in their myRA account for the rest of their working lives. Can Obama truly believe that saving $15,000 over 30 years will contribute significantly to the retirement challenges that real families face? He doesn’t make that task any easier. The choice of investments in myRA is limited solely to government savings bonds. Never in the history of retirement planning have the choices offered to workers been more severely restricted or more inappropriate. 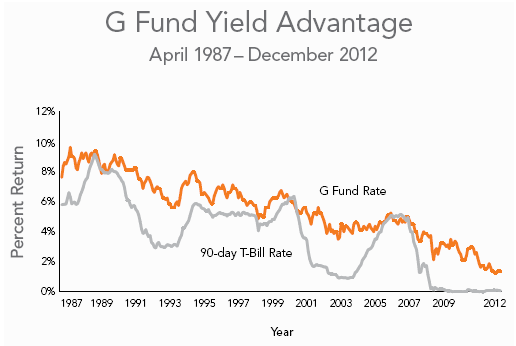 The TSP G Fund interest rate recently rose from 1.45% to 2.50%. Government savings bonds are debt securities issued by the Department of the Treasury to help pay the government’s borrowing needs. The savings bonds in myRA are going to pay the TSP G Fund interest rate, which recently rose from 1.45% to 2.50%. Over the past three years, the TSP G Fund has appreciated 5.92%. Inflation, even the official underreported number, has been 6.95%. Over the same period, the U.S. Total Bond Market index has appreciated 10.10%. On the stock side, the S&P 500 has appreciated 56.82%. Investment vehicles that underperform inflation are unsuitable for long-term retirement planning. Prior to 2000, the TSP G Fund may have outperformed actual inflation, but since then its yields have plummeted as the Fed has held interest rates low. Bonds historically average 3% over inflation and provide stability for the next five to seven years of retirement withdrawals. The optimum bond allocation for younger workers is normally very small. Unless workers save a massive amount of money, they need the growth of stock investments to meet their retirement goals. The TSP G Fund was chosen because the U.S. government is unlikely to default, making the principal and interest of the fund relatively safe. It was not chosen for its high performance or suitability for meeting retirement goals. The option of investing $15,000 in a TSP G Fund only serves to distract American workers from meeting their retirement goals. Only investing $15,000 in a TSP G Fund almost certainly puts myRA participants’ retirements in jeopardy. If private sector plan sponsors offered this plan to their participants, they would be called crazy. They could also go to jail. Although myRA is similar to the government’s Thrift Savings Plan, if the plan were a 401(k) in the private sector, it would violate multiple fiduciary standards required by the government’s own legislation. ERISA laws are intended to protect investors from plan sponsors who might use participant resources for their own advantage. Unfortunately, this is precisely what Obama’s myRA account does. It violates multiple ERISA guidelines and would be illegal for a private plan sponsor. Under ERISA, plan sponsors are not allowed to make transactions with plan assets that would benefit them. This is true even if the action would also benefit plan participants. This prohibition against self-dealing includes using plan assets to loan yourself money, even if you pay a wonderful interest above market rate. All government savings bonds, the TSP G Fund included, are debt securities issued by the Department of the Treasury to help pay for the government’s borrowing needs. They pay a below-market rate, and the government benefits from their purchase. It is like a company borrowing money from its pension fund at the expense of their retirees’ returns. It is a prohibited ERISA transaction for good reason. Yet this is precisely what Obama’s myRA requires. Additionally, plan sponsors must identify potential conflicts of interest and address such conflicts while remaining loyal to their duty to plan participants. Letting participants have the option to purchase an investment vehicle the plan sponsor benefits from is already a conflict of interest. To have a plan in which participants may only purchase securities from the plan sponsor is a serious breach of fiduciary duty. Lastly, fiduciaries are obligated to offer diverse investment options and allow participants to craft a personally appropriate asset allocation. Even a plan exclusively offering a wide range of bond choices fails to provide the ability to diversify against the risk of inflation and would violate ERISA laws. Obama’s myRA plan not only offers only bonds, it only offers one bond, yet another violation of ERISA. 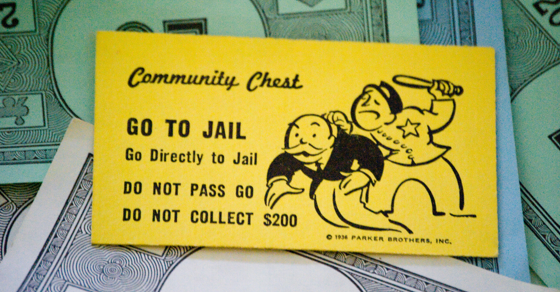 Willful violations of ERISA legislation carry criminal penalties of up to a year in prison for the plan sponsor and a fine of up to $100,000 for the corporation. Likely ERISA will not pursue Obama for his breach of fiduciary duty. However, because the Supreme Court ruled that workers could sue their plan sponsor over ERISA violations, it will be interesting to see what justice is served if the myRA plans come to pass in this format.